As the season begins to draw towards a close, Hï Ibiza recently announced the first official closing party. 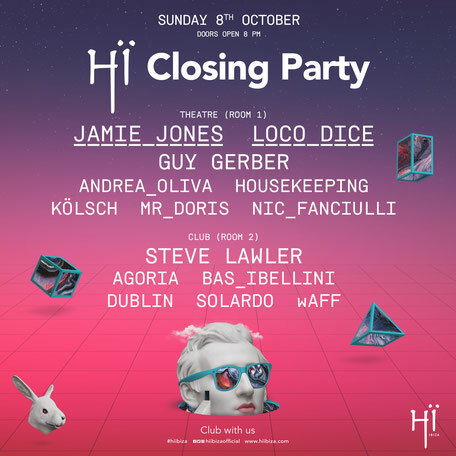 Taking place on Sunday 8 October, the closing party features a line-up of Ibiza favourites, including Jamie Jones, Loco Dice and Guy Gerber, residents Steve Lawler, Andrea Oliva, Nic Fanciulli and Kölsch, plus many more! The club has apparently had a phenomenal summer since opening the doors to its debut season in May 2017, fast becoming one of the island’s hottest tickets and drawing in crowds night after night. With its residents, state of the art design and sound and a commitment to putting the clubber at the centre of the experience, Hï Ibiza has proved itself to be a force to be reckoned with. The club’s grand finale aims to raise the bar even higher. First up, Paradise chief Jamie Jones will make his Hï Ibiza debut and Desolat founder Loco Dice is also set to make a special appearance too. Guy Gerber will make a welcome return to the Theatre (Room 1) joined by In The Dark DJs Kölsch and Nic Fanciulli, fellow resident Andrea Oliva, local favourites Housekeeping and Mr Doris. Over in the Club (Room 2), In The Dark resident Steve Lawler will be taking control of proceedings, joined by French producer Agoria, and Hï Ibiza regulars Bas Ibellini, Dublin, Solardo and wAFF. Presented by Ushuaïa Entertainment Hï Ibiza is ‘decked out with one of the most advanced sound and technologies on the island’ and was designed with the dancer in mind.